The GEN William G. T. Tuttle, Jr. (Ret.) Award for Business Acumen in Defense and Government recognizes an IDB alumni and her or his direct colleagues for demonstrating the application of principles learned in an IDB educational program to achieve outstanding results in their organization. Individual and team submissions are accepted. Each submission must include at least one individual who is a graduate of one or more IDB educational programs. Graduates from all past and present IDB educational programs qualify. Consideration will be given to applicants who have made significant contributions and demonstrated a measurable return on the organization’s investment in their attendance at an IDB program. Recognition at the 35th Annual National Logistics Forum to be held on April 10th -11th, 2019 in Tampa, Florida. Name recognition on the Tuttle Award plaque and possession of the award to display for one year. IDB alumni can self-nominate by submitting an award application. Colleagues, peers, and supervisors of IDB alumni may submit a nomination on behalf of an alumni. Upon receipt, IDB will contact the nominee to confirm acceptance of the nomination and gather submission material. The committee is composed of senior logistics experts from the IDB network including the IDB Board of Directors, Executive Fellows, and LOGTECH Subject Matter Experts. A selection of the top applications is provided to the members of selection committee who review all application materials and select the winner. Please contact Van Noah, noah@idb.org or Deneane Sutton, sutton@idb.org. 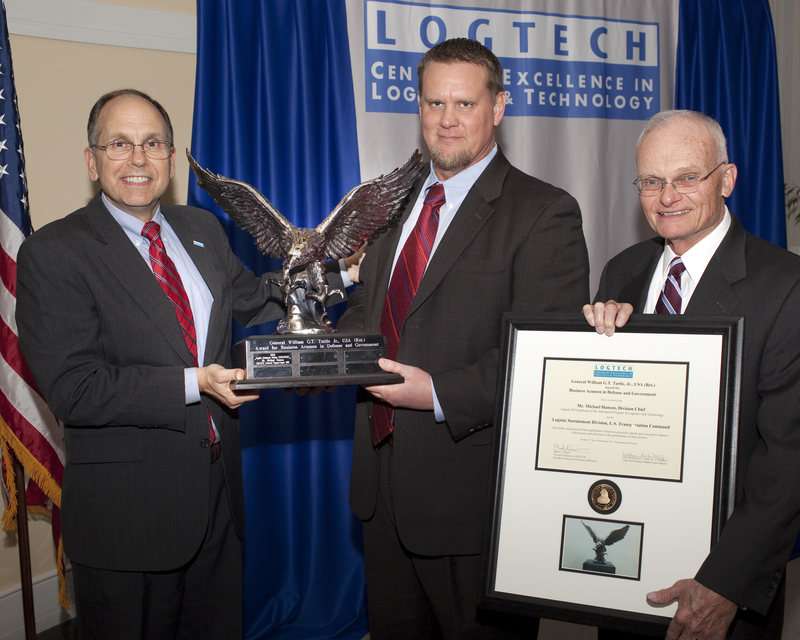 CAPT Lake applied LOGTECH principles to evaluate better methods for producing low-cost, high-volume, industrial materials and commodities, resulting in the implementation of a successful GSA Fourth Party Logistics procurement program (4PL). This program has effectively reduced overhead activities and enabled procurement personnel to focus on large-scale purchases, such as ship engines, motors and cranes. His application of the YARD’s production process efficiencies increased the Industrial Production throughput and revenue while decreasing the labor rate for workforce production by 4% per hour. The savings were applied to other projects to lighten the maintenance backlog. CAPT Lake has applied lean manufacturing to ensure fleet readiness and initiated a Service Life Extension Program (SLEP) for a small fleet of 65 training vessels. YARD employees have used their engineering expertise to efficiently complete a major refurbishment in a 12-month cycle with only a 1% growth. 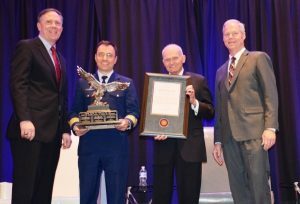 He has demonstrated efficiency, innovation, and leadership which earned recognition by the American Society of Naval Engineer (ASNE) and the USCG Naval Engineering Program as the 2017 Lucas Plaque Award winner for achieving excellence in Naval Engineering. 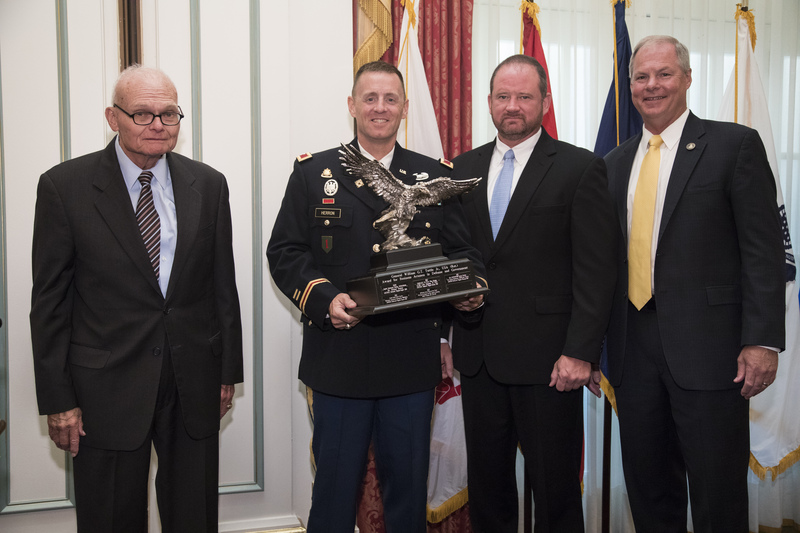 McAlester Army Ammunition Plant (MCAAP), led by a team of graduates from the Institute for Defense and Business’ Depot and Arsenal Executive Leadership Program (DAELP), has initiated a broad range of organizational, procedural and cultural changes. The concepts presented in the DAELP curriculum are interwoven throughout these changes and have provided the structural framework for MCAAP’s leaders to mold their vision for the long-term success of the plant. The result of this work is MCAAP’s strategic plan, aptly entitled Over the Horizon. It clearly lays out who MCAAP’s culture, competencies, process, governance structure, business philosophy, vision, and how they are turning plans into synchronized actions and metrics. This comprehensive plan for simultaneously running two business units (distribution and production) and a small city (the installation) with an economic impact to Southeastern Oklahoma of over $475M through a Working Capital Fund structure is critical for the long-term success of the plant, the community, and the workforce. Additionally, MCAAP has an embedded culture of continual process improvement through the use of LEAN, Six Sigma, and value engineering that has saved over $18M in FY15 and over $23M in FY16. These efforts have allowed MCAAP to consistently sustain the lowest rates in Army Materiel Command and provide quality, low-cost products to its customers. 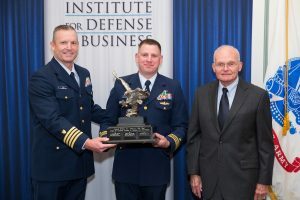 The men and women of the U.S. Coast Guard’s National Industrial Enterprise (NIE) workforce successfully re-engineered the NIE into a unified and modernized organization that directly supports and exemplifies the Deputy Commandant for Mission Support (DCMS) mission support business model of total asset visibility, bi-level maintenance, configuration management, and product line management. This was a significant Business Process Re-engineering initiative valued at $330 million dollars, the largest in the U.S. Coast Guard. Contributing to the success of this massive effort were logistics and business acumen principles obtained by members of the U.S. Coast Guard while attending the LOGTECH Advanced Program in Logistics and Technology, and more importantly, applied to this monumental enterprise-wide effort. The men and women of the NIE have greatly improved the Coast Guard’s capabilities and have led to the best industrial performance in program history accounting for over a 100% increase in fully burdened production value since the establishment of the NIE in 2012. Through extensive collaboration with customers, master production planning, business line analysis and work distribution, the organization attained an increase in labor utilization while generating an average 30% cost savings over equivalent commercial contracts. In addition, strong financial controls were instituted which eliminated a $2.5 million dollar operating deficit, returned over $31 million dollars in outstanding obligations to the general ledger and resulted in a balanced operating account for the first time in 20 years. 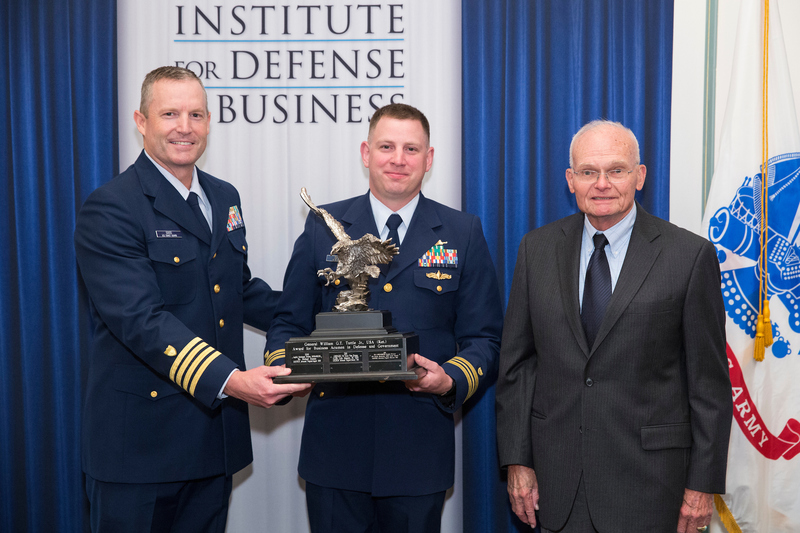 Their efforts also established a foundation for CFO compliance, made targeted recapitalization of industrial equipment possible and created an innovation fund to enable local improvements in equipment, facilities, and training. During intense operations in support of Combined Joint Operation Area-Afghanistan, Colonel Emily Buckman, and her team applied logistics and business principles learned during the LOGTECH Advanced Program in Logistics and Technology to create innovative approaches in supply chain operations. Laying the foundation by creating the new Defense Logistics Agency-U.S. Transportation Command Support Division (DLA-T), Colonel Buckman and her experts ensured a robust level of strategic flexibility by instituting the “band of excellence” algorithm concept which overcame fluctuations in weather, speed, cost and political will encountered in transiting contributing countries, from the Northern Distribution Network in the north to the Pakistan Ground Lines of Communication to the south and east. 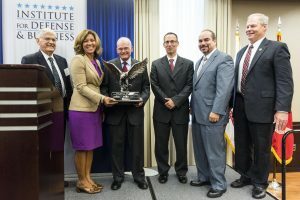 She also created a two-way multi-modal support mechanism through Riga, Latvia reducing airlift costs from $5.00 to 80 cents per pound, resulting in a savings of up to $700,000 per flight; and through the TRIDENT FOCUS IPT formed new enterprise level business rules that redirected transport of low priority cargo. Cost avoidance in the first year alone amounted to over $150 million dollars. With the new system, ships staff have access to all the information they need for each port they visit and now also are able to provide reviews to further inform future users. Each year 300 to 375 port visits occur in the Western Pacific costing more than $50M. LCDR Almanza moved the system from a reactionary nonstandard process to an efficient and convenient process for ships visiting any ports in the western Pacific. The system provided accountability that ended expensive practices like $1M extra water taxi rental when the cost was already covered under a port visit agreement. It also helped maximize Navy refueling to avoid very high port fueling costs. To date the efforts produce monthly cost avoidance ranging from a few thousand dollars to an instance of $500K at a single port visit. These savings allowed the Commander, Pacific Fleet to increase the number of theater engagements with partners and allies, strengthening theater and national security. Mr. Hansen and his team optimized distribution using business principles reinforced at the LOGTECH Advanced course he attended. The fundamental principle Hansen used was to take an enterprise-wide look to improve performance in order to overcome inefficiencies and excessive costs driven by local optimization policies. Hansen’s team found that pure pack containers were often not speeding delivery to the customer as intended, and that the benefits of reduction in handling and potential speed gains at forwarding distribution points were outweighed by the extended pipeline created when the modes of transportation were only partially filled by the light loads intended for one unit. They knew that the old pre-pure pack metric of maximizing container and aircraft weight or space was also not the answer. The answer was to find the optimal balance between pure pack and mixed pack pallets or containers that would depend on the receiving distribution center’s capacity to repackage or route cargo from full pallets or containers. The Logistic Sustainment Division’s use of business principles and analytics produced straight forward tools and procedures that yielded savings of $123 million in 2010 and improved velocity by 20% in sea containers while increasing aircraft utilization on all airlift missions by 11.7 percent with far more aircraft meeting the 90% utilization goal.